Thank-you to everyone who attended our session and visited our booth during the National P.E. 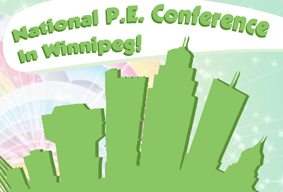 Conference in Winnipeg during the last weekend in October! 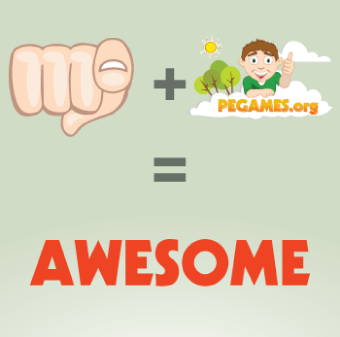 The response to pegames.org, our session and our books was absolutely incredible! Laying out our fitness/game-centric model for P.E., one that focuses on keeping the most kids active for the most amount of time possible, was instrumental to our success at the National Conference. Our session was 2 hours of fast, fun, inclusive games that had just shy of 100 people playing, learning and laughing along with us. At our booth, book sales were fast and furious, especially with the launch of our second book of 100 Games (soon to be released in eBook and hardcopy format online)! All of the comments we received from both current and new pegamers alike were overwhelmingly positive, and the feedback we received from both book buyers, as well as the individuals in our session, was to keep on creating quality, fun, fitness-based games that keep our kids active! In the exhibitor area we were fortunate enough to cross path with Matt from Gopher, and were amazed at both the quality and quantity of their phenomenal equipment. Not only did Gopher donate all of the equipment used for our pegames.org presentation, but they then allowed the local school district to keep it in order to keep the fun going! If you haven’t yet been to Gopher’s website, and if you love quality physical education equipment, be sure to check them out (www.gophersport.com)! Also in the exhibitor area, it was a pleasure speaking with Ron and his partner from Basketball Canada. Pegames.org and Basketball Canada have many similar views when it comes to keeping kids engaged and active during all P.E., and we will continue this conversation as pegames.org continues to grow! Speaking with Michael from Wintergreen, as well as the Canadian Paralympic Committee, Daunean from SPEA and several members of CIRA were also highlights of the National Conference. With this many caring and intelligent people behind the health and well-being of our kids, pegames.org knows that we are on the right track to getting our kids up and active. On the flight home it was also a pleasure to share a seat beside Mo (past president of PHE Canada). And although she wasn’t at our session, we think that we have another convert to the philosophy of pegames.org! Thank-you again to all of those who attended our session, bought our books and gave us such overwhelmingly positive feedback! We are already planning our next 3 conference visits, based on invitations we received at the National conference, and will be sure to post new conference dates to pegames.org as they are finalized. If you have any questions or comments, please feel free to contact us or post them to the site! Thanks again and keep on playing with pegames.org!